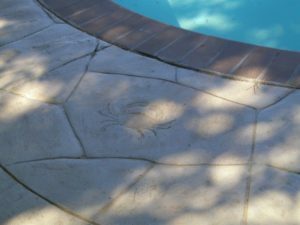 Artistic Stamped Concrete of Maryland Inc. has some of the best pool deck concepts on the east coast. The above picture was just us having fun! We love being able to come out and see a nice swimming pool and consult with you on a one-of-a-kind design idea that going to impress your family and “wow” the neighbors. The more creative you allow us to be, the more awe-inspiring the design we create. Your pool deck is a personal attest to the art we create every day. Have a look through our gallery below or Call Us For a Consultation Today!